Yes I am taking another liberty with my personal challenge of discussing books with one word titles for my penultimate contribution to the crime fiction alphabet but, having been rather heavily ensconced in the madness that surrounded this particular event, I couldn’t resist discussing at least one of the plethora of books that were churned out in the lead up to 1 January 2000. For those who don’t remember, the problem (variously named the Y2K problem, the Year 2000 problem, the Millennium Bug etc) related to a supposed catastrophe that would befall the world because most computer code used 2 digits to refer to years (eg 97, 98, 99) and when the calendar rolled over to the year 2000 the computers would all think it was 1900 and mayhem would ensue (there are now and were then several dozen very logical reasons why no major catastrophes were ever going to happen but in our modern world we tend not to let facts get in the way of a good fear campaign so international committees were established and many dollars were spent to fix the non problem). 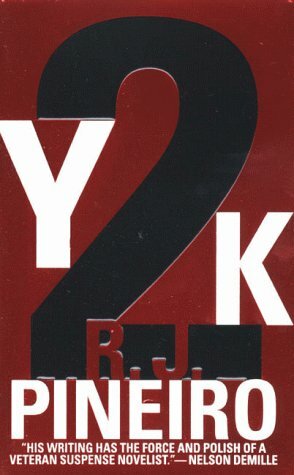 Y2K was thriller writer R J Pineiro’s second book to address the predicted digital doomsday (his other one was called 01-01-2000 and was published the same year). It was one of the more bizarre efforts at the genre within a genre and if memory serves me properly involved a villainous Slobodan Milosevic (presumably taking time out from committing genocide and whatnot) developing a scheme to bring the US to its knees by making all its computers non-compliant with Y2K requirements. His evil henchmen are battled by a female ex-CIA agent whose name escapes me but I do recall that she left the CIA after many years when her lover was killed but is forced back into the world of espionage and people killing each other for nonsensical reasons by the hunt for a world-saving millennium bug code. I don’t recall much else about the book. Why did I read this book? For some sins committed in a previous life in the lead up to 1 January 2000 I was working in an IT section of a large government department and inherited responsibility for ensuring that our particular part of the world didn’t come to a disastrous halt on T H E B I G D A Y. From the outset I was more than a little skeptical of the need to spend hundreds of thousands of tax payers’ dollars hiring blokes who could only afford their Brooks Brothers suits and BMWs because they’d managed to scare the bejesus out of bureaucrats the world over and was known to rant at length about the idiocy of the entire thing. As a mood lightening exercise one of the project team members gave me a book called Y 2 K: The Millenium Bug by Don Tiggre as a joke and things snowballed from there. It became great sport to see who could find the silliest Year 2000 related book for me and I ended up with quite a collection. I love that my favourite genre often tackles the big subjects facing the world with more heart and insight than any other kind of writing, including journalism. The flip side of course is that, on occasion, it also tackles the nonsense subjects that distract personkind from the things that matter. You have to take the good with the bad I guess and we can at least rest easily that this book, and the dozens of others on the theme, are all now the pulp that they should always have been because they’re dated and irrelevant. I do like to play the “what will be next” game though. Swine Flu thrillers possibly? This entry was posted in Crime Fiction Alphabet, memes and challenges, mini review, R J Pineiro, USA. Bookmark the permalink. Funny post! I well remember the Y2K bug and all the panic, too. My dad was quite pleased as he worked for the main UK computer company and they asked him and fellow retirees to come and help with the pre-panic checking ….a bit of extra pension! Funny that it all ended up to be “much ado about nothing” – we’ll never know if it is because we were so well prepared or if it was in fact all a scam by the suits and BMWs! Bernadette – Thanks for a much-needed laugh : ). I distinctly rememeber the whole Y2K panic, although I wasn’t involved in the computer business. I read scores of dire warnings about what was going to happen, and I knew several people who took all kinds of odd precautions. It was a s-t-r-a-n-g-e time! OK, I’m going to be the “Debbie-Downer” at the party and disagree with your assessment that nothing was going to happen if the Y2K problem was not fixed. If there were very few problems when the calendar turned over to January 1, 2000, it was because people had work tirelessly to correct codes for the prior two years leading up to the date. Everything from how taxes & social security were calculated (we never dreamed so many people would live to be 100!) to how gas & sewer lines and electricity grids were maintained would have been affected. At the time, I was working for a company that produced tax processing software. Believe me, we were going to have a problem on our hands (if not on January 1, 2000, then at some point down the road), if the date codes were not fixed. Because most of the fixes worked (and a lot of DOS-based programs were eased into retirement in the process), we don’t think Y2K was a big deal…but, if it hadn’t been fixed, we would have experienced some problems–not Armageddon perhaps, but how long would you like to be without electricity or a functioning city sewerage system or gas (petrol) pumps that work? But it doesn’t detract from the fact that there were so baaaaaadly-written books attempting to stoke up (and cash in on) Y2K fear. Well Debbie we’ll have to agree to disagree on whether or not the Y2K problem was even a smidgen as big as it was portrayed. My own experience, responsible for the system which runs one part of a large city’s infrastructure and in daily contact with my counterparts in other parts of the same government, our testing showed that that nothing terribly dramatic was ever likely to happen and lo nothing did, even though we never did finish fixing all the code or replacing all the back end systems, one of which (yep a DOS based one) still operates today minus any Y2K compliance whatsoever. What seemed missing to me then (and is often missing to me now in similar panics that take place) is any assessment of causal links between A and B. Of course it is true that most computer codes did indeed store dates as 2 rather than 4 digits but there was rarely an assessment of how, or indeed if, such a thing would actually impact any given system. In the vast majority of cases the reality was that it probably wasn’t going to have any impact at all. But as seems to be the way of the world these days “we” collectively beat with a giant mallet a problem that really only needs a gentle nudge. Of course I admit to being incredibly cynical (I’ve worked for too many politicians to be otherwise I’m afraid) but I do feel some sadness that we seem destined to repeat mistakes like these. Agree totally on present-day mass psychology, Bernadette. I now realise why old people go on about “the younger generation” etc, as I find myself increasingly doing it myself.